It’s bitter cold here in the Northeast. My kids seem to have the gloves-boots-hat set permanently attached to their bodies. I haven’t received mail for days: our mailman just isn’t into climbing the snow mound that blocks our mailbox. And yet, I can’t seem to quell this rumble of excitement, this surge of anticipation. Christmas is over. So what is it? It’s hope. I’m feeling hopeful, even with these seemingly endless days of ice and snow. President Obama gives me hope. And someone else does too: Thomas Friedman. If you don’t know him, Thomas Friedman is the foreign affairs and occasional op-ed columnist for the New York Times. (If I could, I’d promote him to “Our World Affairs” columnist). I became a fan of his writing early on when I realized he writes from a systems perspective. What does that mean? 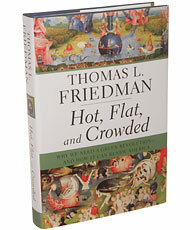 You’ll rarely find Friedman focused on just a part or a fragment. To Friedman, nothing stands in isolation. Instead, he writes about systems – interrelated parts and processes that continually affect each other over time. And he sees systems patterns everywhere — in escalating gas prices, in financial markets, in the dynamics related to female literacy, in wildlife management – and he wants his reader to understand these systems as well. Recently, Friedman has taken it up a notch, and has started to urge us all to take a more “systemic approach.” (see Hot, Flat & Crowded, p. 199). To this I say, Hallelujah! Like Friedman, I want people to understand these systems, and I want them to see systems too. Why? Most Americans, including our industry and government leaders, haven’t been taught to see systems. In school, I was taught that the best way to understand a subject was to analyze it or break it up into parts. It wasn’t until I took courses as an adult that I really learned to see systems of multiple causes, effects and unintended impacts. Yet these are the skills we need to navigate interdependent financial systems, complex energy relationships and issues of global impact such as climate change. Without these skills, we continue to operate from crisis to crisis, stuck on the problem solving treadmill, where our “solutions” often only create more problems or make the original problem worse. In each “Friedman Project’ entry, I’ll walk you through the system or systems Friedman is discussing, using simple causal maps. (Click here to see how I’ve done this for educators with children’s books). In this way, we can all build our systems muscles, and more readily recognize systems in different settings. I hope this thread also helps you to make systems — rather than fragments — the context for your own learning, problem solving and design efforts. I’ll post the first Friedman Project this week. Let me know what you think. * To be literate means you have a good understanding of a particular subject, like a foreign language or mathematics. In this case, the subject is (living) systems.